Tina Cai and Zachary Marin, students in the Chinese Language Flagship Program in Arizona State University’s School of International Letters and Cultures, have been awarded the Fulbright-Hays GPA Scholarship to study in China this summer to improve their Chinese language and cultural skills. Madeline K. Spring, professor of Chinese and the director of the ASU Chinese Language Flagship Program and Confucius Institute, says learning to communicate well in another language should be an important part of a college education. Despite being the daughter of first-generation Chinese immigrants, Tina Cai, a Barrett Honors College junior majoring in English literature and economics, says she initially resisted the idea of embracing her Chinese heritage. Cai, who grew up in Tempe, dropped out of a Chinese language-learning program at the age of 13, and continued to pursue other interests such as writing and music. After graduating from high school, Cai applied to Arizona State University and Brown University, and was accepted at both. 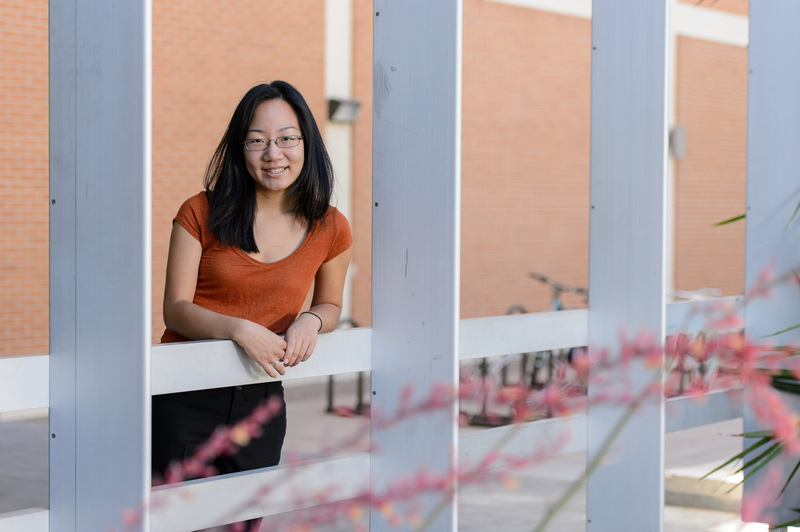 Cai joined ASU on a full scholarship from the Flinn Foundation, a Phoenix-based private philanthropic foundation that works with Arizona universities to retain talented students, and stumbled into the Chinese Flagship program during her freshman year. To her surprise, she enjoyed the language immensely and decided to pursue it again. After her freshman year she received a Chinese Language Flagship scholarship to spend the summer in China as a participant in ACC’s Intensive Language Program in Beijing. “The program is not just about learning Chinese; it also allowed me to immerse myself in the Chinese culture,” she says. Inspired by her experiences, Cai applied for and was awarded a Fulbright-Hays GPA Scholarship to attend the ACC Summer Field Studies program in June. The trip will include an intensive language program in Beijing, coupled with three weeks in rural China. Cai based the presentation and lesson plans on her own experiences – both as a student in American public schools, as well as a teacher at the Arizona State Prison Complex in Florence. She has critiqued inmate-produced poetry and prose under the Pen Project internship, a prison-university project that partners with New Mexico Corrections Department. The internship is part of the Department of English’s Prison English program that educates incarcerated individuals. She has also taught Shakespeare to inmates at the Florence State Prison in Pinal County, Ariz.
Joe Lockard, associate professor of English and director of the Prison English Program, says Cai has been one of the most active teachers in the program. Madeline Spring, director of the Chinese Language Flagship Program and a member of Cai’s honors committee, notes that the list of Cai’s achievements is extensive. Cai says she isn’t sure of a career path yet, but is interested in exploring different possibilities. For now, she wants to remain involved in prison education programs, as well as examine the shifts in modern Chinese culture in the form of creative non-fiction essays or a memoir for her honors thesis. She also plans on spending a Flagship Capstone year in China in the academic year 2014-15. The Department of English and the School of International Letters and Cultures are academic units in ASU’s College of Liberal Arts and Sciences. Read about Zachary Marin here. 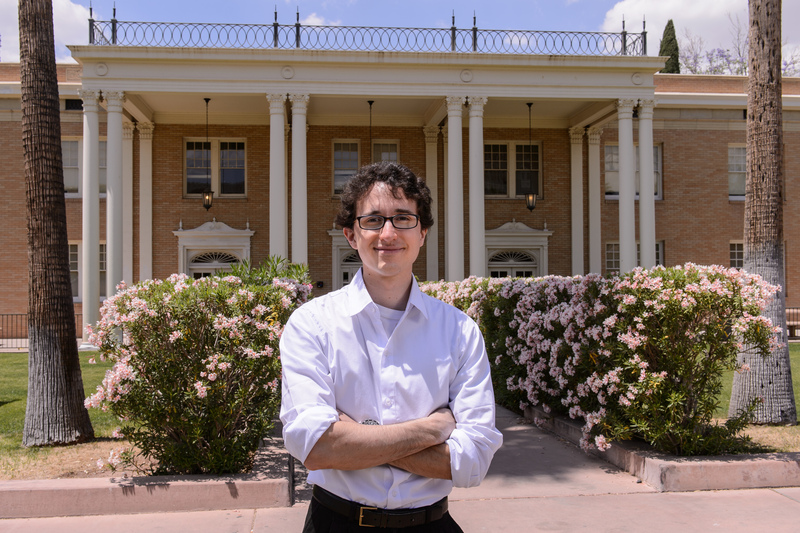 Zachary Marin, a student in ASU's Chinese Language Flagship Program, has been awarded the Fulbright-Hays GPA Scholarship to study in China this summer. Zachary Marin and Tina Cai, students in the Chinese Language Flagship Program in Arizona State University’s School of International Letters and Cultures, have been awarded the Fulbright-Hays GPA Scholarship to study in China this summer to improve their Chinese language and cultural skills. Zachary Marin, a junior who is also in the School of Life Sciences and Barrett, The Honors College, says a sense of adventure, an ASU professor and Google spurred him to join ASU and major in Chinese. Here’s how it happened: Marin, while still a high school senior, was at a family gathering where he met Spring. They discussed his interest in doing something unique; that’s when Spring suggested he look into studying Chinese in college. Marin, a Scottsdale native, loved the language and decided to visit China for an advanced ACC language-learning program the summer following his sophomore year. Marin made many friends in China during the trip and is now getting ready to go back in June – this time on a Fulbright-Hays GPA Scholarship. Marin says the ultimate goals of the program are to advance participants’ language abilities, expand their knowledge about education issues through first-hand teaching experiences and conferences, and enhance mutual cultural understanding by comparing the Chinese and American education systems. For his honors thesis, Marin will work closely with Stephen Bokenkamp, his adviser and professor of Chinese, to translate a paper in Classical Chinese to English. Spring says an example of Marin’s focus and perseverance is his volunteer work in the institute’s outreach programs for K-12 schools in the greater Phoenix area. But that’s not all. In addition to studying Chinese, Marin is majoring in genetics after losing close family members, including his mother, to cancer at a young age. He joined Barrett after conducting thorough research on life sciences schools at research institutions across the U.S. and finding SOLS to be the perfect fit for him. He turned down offers from the University of California in Davis, University of Colorado in Boulder and University of Arizona. During his sophomore year, Marin worked in a population genetics lab, examining populations of chimpanzees and bonobos at the genetic level to understand their evolutionary history and the 1 percent genetic variation that separates humans from chimpanzees. Marin says he switched gears junior year to explore a different research interest. Marin is also an accomplished musician, taking after his father who passed away recently. He has participated in ASU’s Schola Cantorum and Solis Camerata choir music ensembles, and plays drums in his spare time. He attributes his success to the love and support of his sister Rachael, the Wifler family, his family and friends, and the extended family he found in faculty members and classmates at ASU. Marin says he’s keeping his options open when it comes to choosing a career. For a tenacious 20-year-old who’s majoring in genetics and Chinese, and is a talented opera singer and drummer, that is a wise idea, considering the world is his oyster. The School of International Letters and Cultures and School of Life Sciences are academic units in ASU’s College of Liberal Arts and Sciences. Read about Tina Cai here.